Yesterday was the wedding of American Meghan Markle (of the TV show, Suits) and Prince Harry (of the long-running British monarchy). It was pret.ty spectacular. When it comes to pomp, circumstance, and knock your eye out splendor, nobody tops the British royal family. I know the status of the royal family is sometimes a hot button topic — taxes (both what they pay, and what supports them), sketchy histories (colonialism), and all that subservience (did Meghan forget to curtsy? Horrors!). From a GDP perspective, though, the tourist economy in particular, consider England as a travel destination without the royal family. Would it be as much fun? 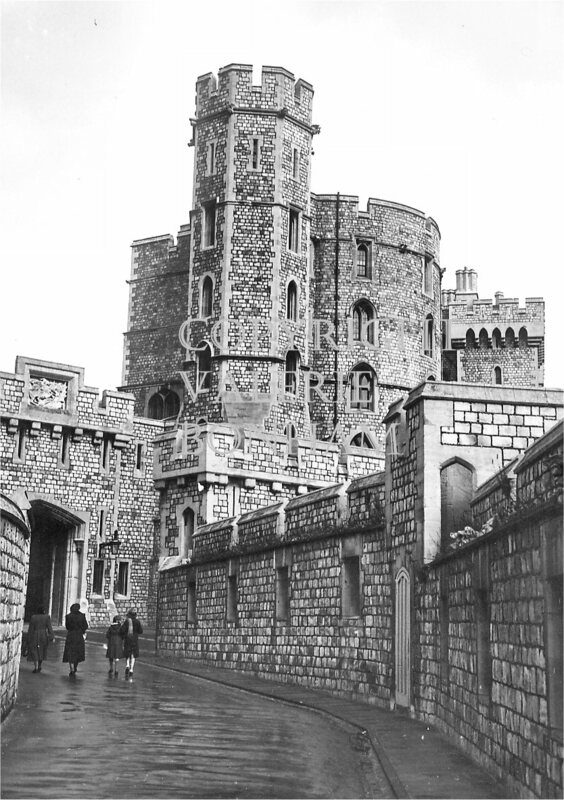 Yes, the country has all those chocolate box villages, the venues of detective novels, and, of course, tea, but what would, say, London be without visiting the Crown Jewels in the Tower? Without peering through the gates of Buckingham Palace at that balcony? Without strolling along the Long Walk in Windsor Great Park? 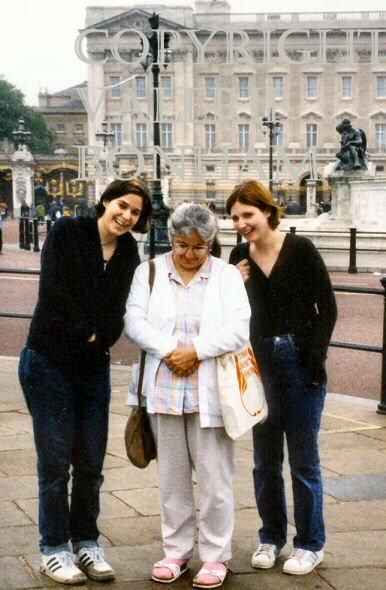 May, 1999 My daughters and I in front of Buckingham Palace. My husband and I and the girls took a day trip via the Chunnel from Brussels to London. The girls were acting like loud tourists to embarrass me. What would London be without all that? Maybe financial-Frankfurt-without-Americans-needing-a-translator? Frankfurt’s nice enough (I used to live there, as well as near London), but all of Sachsenhausen doesn’t have quite the international cachet of even 221B Baker Street. But back to yesterday’s wedding. While I was watching the DVRed PBS coverage of the wedding, I kept feeling this odd sense of déjà vu. My first memories are of living near London, but most of those memories are of rain, of birds singing, and the sound of tires on wet pavement. Why did watching this wedding have a similar effect? Curious about the feeling, I looked through old photos. Sure enough, there were the images. Windsor Castle. 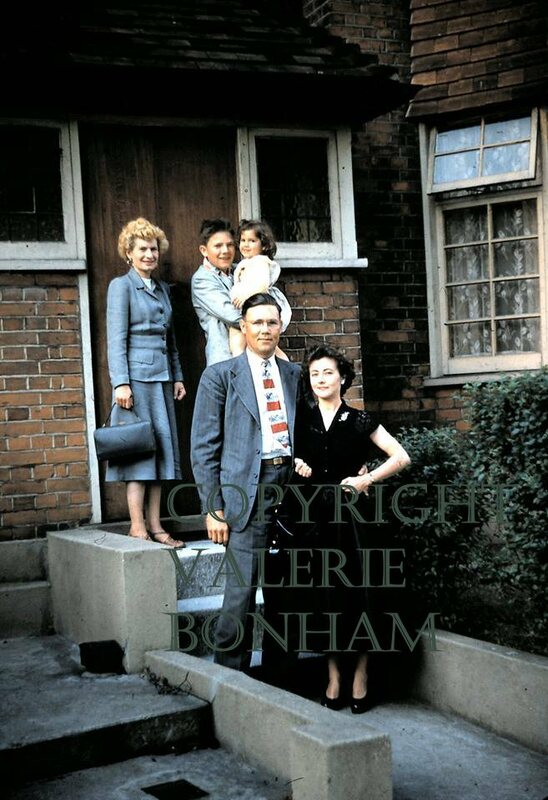 The originals are in a family photo album from 1950 from the time when we lived in North Harrow when my dad was assigned to the American Air Force facility at Bushy Park. Or maybe West Drayton? Or Ruislip? Or maybe each in turn? 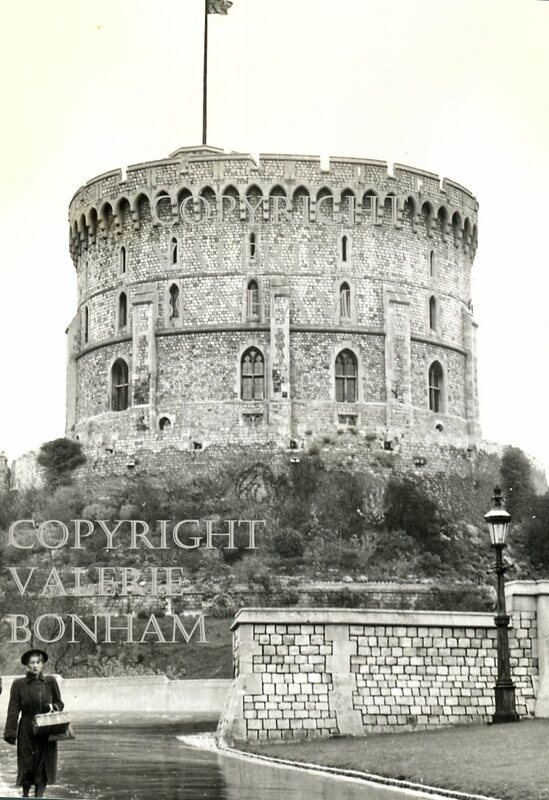 The Round Tower at Windsor. I was far too young to remember that visit, but a few years later our family went on another outing to Windsor, this time with family friends, my “Uncle” Andy and “Auntie” Hazel and their son. The outing must have been a happy one as I remember walking around the grounds of Windsor and posing with the guards. I don’t recall any crowds, just the buildings, stone benches, and a green vista on an overcast day. My dad’s photo that survives from that day is a slide of us gathered together before we set off, so I have a gorgeous depiction of us in vibrant Kodachrome. All of us ready for a visit to Windsor. Mom is the blonde. The others are my “Uncle” Andy, my “Auntie” Hazel, and their son. We’re outside their house and Dad took the picture. I’m the one being held. Thanks to my Air Force childhood, I enjoyed Harry and Meghan’s wedding more than I expected all because of my “I was there” déjà vu.